This is a kamado style grill. I found it at Lowes on sale and had to have it. Prices on an Big Green Egg were never going to fit my pocket book. I have grilled amazing steaks in 7 minutes, made smoked meatloaf, grilled salmon, roasted chicken in the last 5 days with family wanting more. 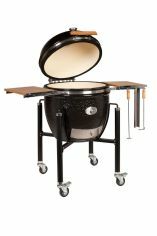 This Grill is on sale for $399.00 on line at Lowes.com if you have wanted a Big Green Egg style grill you can't go wrong. It comes with a rolling stand, an ash removal tool and extra gasket material. Other brands sell these separate. Online customer service reviews are good. I have found many Big Green Egg extras fit this grill also. Great grill. It's great to hear this ceramic grill being raved about although I have seen some opposing views stating that whilst being cheaper than the BGE it's not in the same quality league. To my knowledge there are at least 5 manufacturers of kamado grills in China and speaking from experience I know that the quality is distinctly variable from manufacturer to manufacturer. I guess we'll have to wait for a few more reviews to come in before we have a definitive view.